But she is not a divinity meant only for women who have conceived. She can also cure the curse of infertility, and help women to conceive, have problem-free pregnancy and safely deliver a healthy baby. It is thus believed that she can bestow the faithful with a loving husband, a bright child, a happy family, and a long and happy married life. Garbarakshambiga Pooja is a traditional worship offered to the Goddess and is believed to have the potential to earn her kind blessings for the devotees. 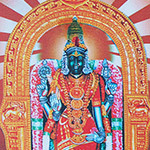 Garbarakshambigai Amman is worshipped in her famous temple in Thirukarukavur, in Thanjavur district, Tamilnadu, where she is enshrined along with her consort Shiva, who is there under the name Mullaivana Nathar. 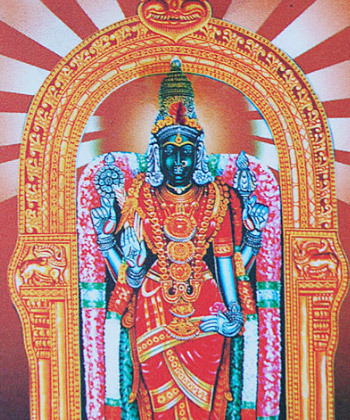 According to a legend, once there lived a woman by name Vedhikai, who was an ardent devotee of the Goddess. Vedhikai to able to conceive thanks to the blessings of the Amman, but her pregnancy soon ran into serious problems, and she was reduced to a state of almost losing the fetus itself. However, the Goddess came to her rescue once again, protected the embryo and ensured that the woman could carry it safely in her womb and deliver a healthy baby at the appointed time. 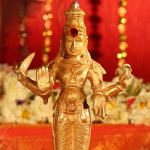 It is also said that there are cases of innumerable women who have also been so blessed by this Goddess, in line with Vedhikai. Hence performing the Garbarakshambiga Pooja and offering prayers to the deity is sure to earn for the devotees, her benevolent blessings in the form of good offspring. Worship is communion with divinity. This is an ever-lasting process and needs to be done with sincerity and faith at all times. 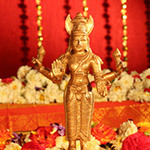 Hence prayers can be offered to a deity on any day. However, as this is a ritualistic worship, our elders have recommended some days and times, as suitable for its performance. 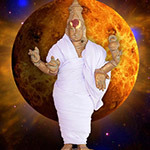 Accordingly, Garbarakshambiga Pooja can best be done on the fifth lunar day of Panchami Thithi. 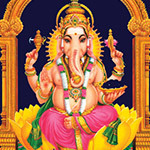 Any auspicious Hora, the period of about 1 hour is also recommended for this worship, and so, people can perform this Pooja during an auspicious Hora of any day. This worship is believed to a gift, especially to a childless couple who are longing for a progeny to continue the lineage. 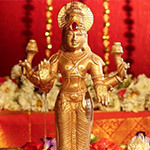 This Pooja can please the Goddess, and her blessings can come down to the devotees in the form of cure to the fertility problems, healthy pregnancy, and safe delivery. 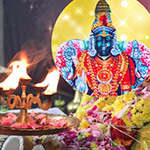 Married women can have a highly satisfied and fulfilling life, and this can be termed as the most significant benefit of Garbarakshambiga Pooja. This mantra takes the name of the Goddess, salutes her and offers her prayers, and is chanted with faith by her devotees during the Garbarakshambiga Pooja, for receiving her divine grace. 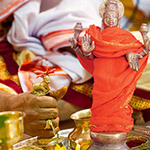 This Garbarakshambiga Pooja performed for 3 months, once a month, invokes the blessings of Goddess Garbarakshambiga. Appeasing her with this special Pooja can bless you with a loving spouse, a healthy child, and a happy family. 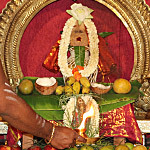 This Garbarakshambiga Pooja performed for 6 months, once a month, invokes the blessings of Goddess Garbarakshambiga. Appeasing her with this special Pooja can bless you with a loving spouse, a healthy child, and a happy family. 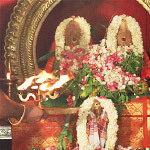 This Garbarakshambiga Pooja performed for 12 months, once a month, invokes the blessings of Goddess Garbarakshambiga. Appeasing her with this special Pooja can bless you with a loving spouse, a healthy child, and a happy family.